HOW MUCH would you pay for the sort of stuff pictured? Tony Geering paid �0 for one table. He then consigned it to Sotheby's where it is expected to fetch �,000 �,000 this week. Geering, 36, is a self-taught spotter of Arts and Crafts furniture, the style whose most famous exponent is William Morris. Until the age of 25, Geering was an engineer on oil rigs. He now presides over The Dome, a former Territorial Army drill hall in Southwold, Suffolk, crammed with furniture decorated with flowing foliate designs or with a distinct Oriental look. Up to half the Arts and Crafts furniture sold by Liberty in London has been discovered by Geering mainly at big antiques fairs and obscure country shops. 'You are the last person I thought would pay cash,' exclaimed the dealer. After recovering his composure, he laughed: 'You can come back any time.' Geering reckons he is now laughing loudest. How did he know the table was by Godwin? 'Its distinguishing feature was the small drop leaves and piano hinges running the length of the flap.' The hinges were typical of the fine craftsmanship of the makers, Collinson and Lock. And the fret pattern of the openwork stretchers had just the kind of airy Anglo-Japanese look that Godwin pioneered. He was well-known as an architect before he started designing furniture and is regarded as a forerunner of the Arts and Crafts Movement of the late nineteenth century, which promoted craftsmanship above mass production. Geering's resolute scruffiness tempts the notion that anyone could make money by beating furniture dealers at their own game. Which is not far from the truth. There was a time when he used to sell, not buy, at Newark. That was after opening a small secondhand shop in Lowestoft, at the age of 24. He sold junk from house clearances. It was a meagre existence. He had given up his �,000-a-year job on the rigs - 'I wanted to do something I loved,' he says. The Godwin table - or, rather, one identical to it - is illustrated in the popular but thorough Nineteenth Century Design by Charlotte Gere and Michael Whiteway (Weidenfeld and Nicolson, 1993). Unlike Geering's find, the one in the book has brass fittings. It is in the Ellen Terry Memorial Museum at Smallhythe, Kent. Godwin lived with the actress from 1868 to 1874. The only other known example, besides Geering's, is in the Metropolitan Museum of Art in New York, attributed to Godwin. But the clincher, according to Christopher Parker of Sotheby's, is Godwin's own design sketchbook in the VandA's archive, showing the top two-thirds of an identical drop-leaf table - without brass fittings. Just like Geering's. Godwin furniture is rare. At London auctions it is fought over. Two Godwin side chairs fetched �,300 and �,000, nearly four times estimate, at Christie's last year. It looks like a bull's eye for Geering. But his life as a dealer is not always so sweet. 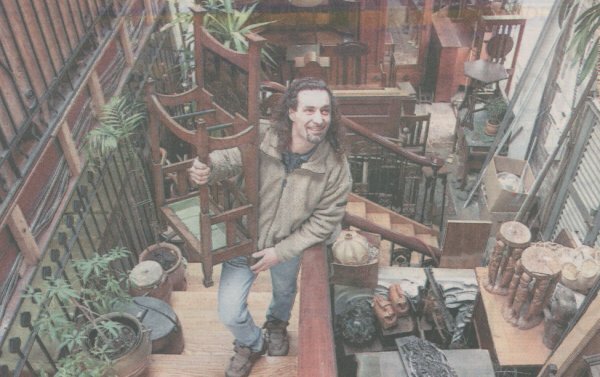 He paid �0 at Newark this year for a delicate walking stick stand that he thought was by Charles Rennie Mackintosh, one of whose dining chairs can fetch �0,000. Some experts raved over it. Others shook their heads. Geering agonised. In the end, no records could be found to authenticate it. His six-figure find evaporated. Then there was the Godwin chair he bought for � at Newark when he had a stall there. 'I knew there was something about it,' he says - and so did another dealer. 'This man came back time after time to my stall, offering �0. He kept saying: 'Tony, you know you're skint, and you'll make a profit, so what's your problem?'. I eventually let him have it for �5 but I really whinged about it.' Was there a problem? Not for the canny buyer. The chair was a genuine Godwin and Geering heard four years later that it had been sold on for �,000. These days, he hesitates to pull the same trick on small dealers or 'runners' - who maybe as strapped for cash as he used to be. He paid a runner �0 for a table made by Collier and Plucknett. The man had asked for �0 Geering knew he could sell it for at least �000. 'My mother said: 'If it's worth �0 give them �, not �. Then they will talk about it,' That's part of the reason I came from nothing to where I am today. 'I reckon I've got only another 10-15 years in which Arts and Crafts furniture will be coming out of the woodwork. A third generation of owners is dying off and it's coming on to the market for a third time, but with each generation there is less of it. 'At the moment, it's still a fantastic bargain. Most of it can be bought for the equivalent of the price it cost to make - �500 for a 1900 bedroom suite, for example. Twentieth Century Decorative Arts and Design, 6 April (l0.30am): Sotheby's, 34-35 New Bond Street, London W1 (020-72 93 5000).